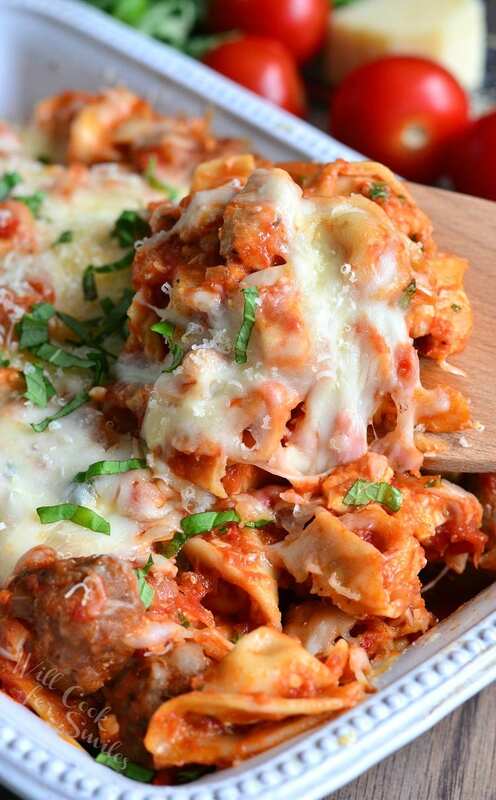 Looking for a delicious, gooey, cheesy casserole dish? 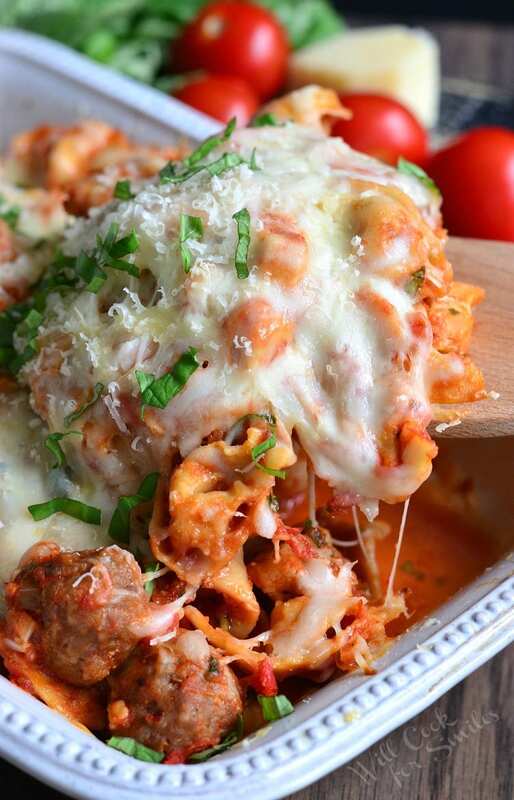 Look no further because this casserole has chicken and sausage, it had tasty tortellini pasta and mixed with pasta sauce and four kinds of cheese. I have been in a full party planning mode. There are only a couple of weeks left until little man’s party and I didn’t even realize how fast time has gone. Seems like it was only a couple of days ago when we made his countdown calendar that showed more than a month until the party. It’s so close now, we’re getting REALLY excited. I am being a little too excited maybe. The other day, I sat down to make the party menu and before I knew it, I had two pages of food ideas. His party theme is Mario this year and I decided to make Italian themed food. Well, you know me, I love making and eating Italian food. So now, my task is to cut the menu to just a few items. That will be tough. Although, some things on the menu really weren’t good for the party, like a casserole. What would a casserole be doing at a children’s party? I do always have food for adults and for kids but still, a casserole? I must have been starting to get hungry from thinking about all that delicious Italian themed food and started thinking about dinner. And, that’s just what I made for dinner. 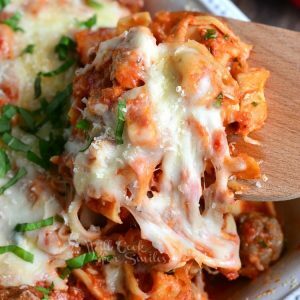 Chicken Parmesan Casserole is what I had written on the menu but for dinner, I wanted to change it up and make something new. My husband always makes fun of me, telling me that he doesn’t let himself fall in love with a dish that I made because he will probably never see it again. I guess that’s a pitfall of being married to a food blogger, I always have to keep coming up with fresh ideas and hardly have time to remake the same recipes. Although, I would have to disagree a little. There are quite a few dishes that make their appearance over and over. I might make a couple of changes, but favorites will always be “coming to dinner” in one way or another. 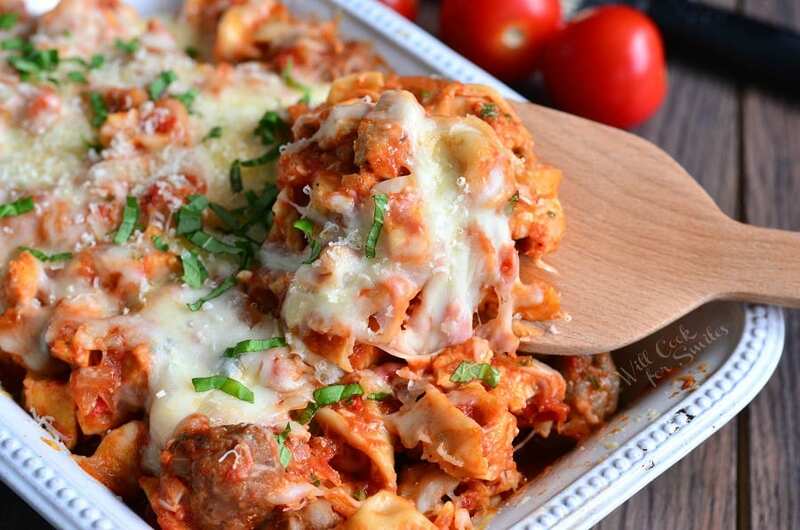 This Chicken and Sausage Parmesan Casserole might be “dressed” a little differently, but it’s all the flavors we know well and love. 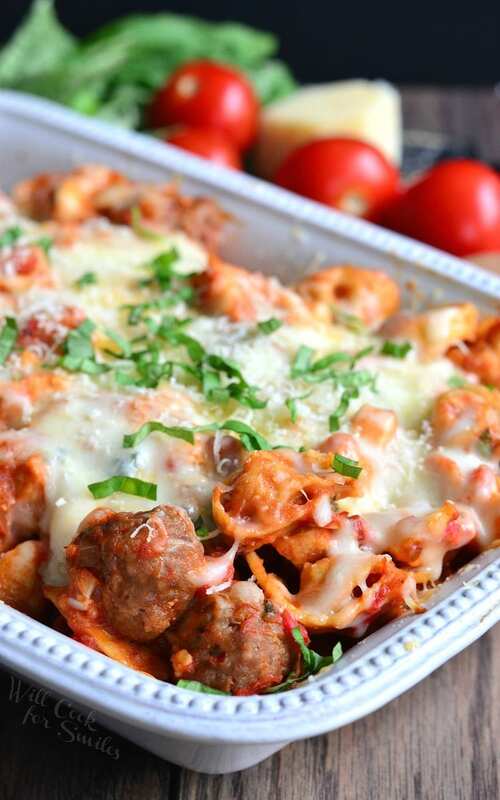 Look no further because this casserole has chicken and sausage, it had tasty tortellini pasta and mixed with pasta sauce and four kinds of cheese. 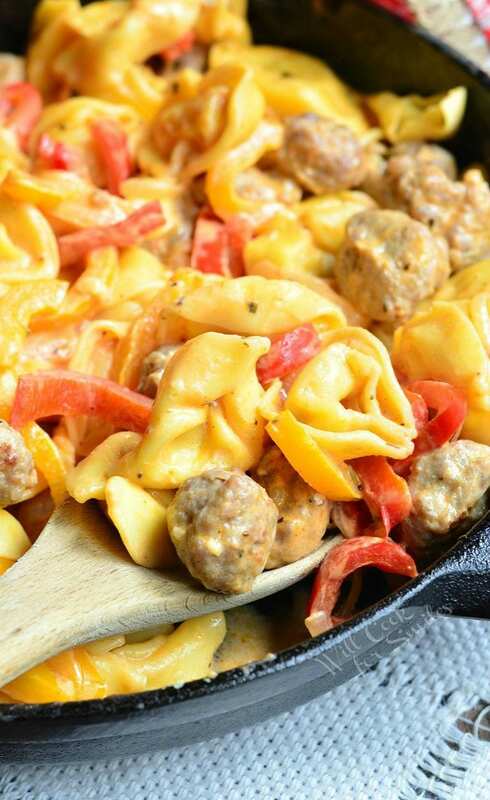 Cook tortellini al dente, drain and set aside into a large mixing bowl. Cut chicken into small chunks. Roll small balls out of ground Italian sausage. Heat up a large cooking pan over medium heat and add some vegetable oil. Dice tomatoes and onion and add it to the cooking pan. Saute for a few minutes. Crush and chop garlic cloves and add it to the cooking pan. Mix and cook for about a minute. Add pasta sauce, minced basil leaves, brown sugar, salt, and red pepper flakes. Stir everything and bring to simmer. Take off heat. 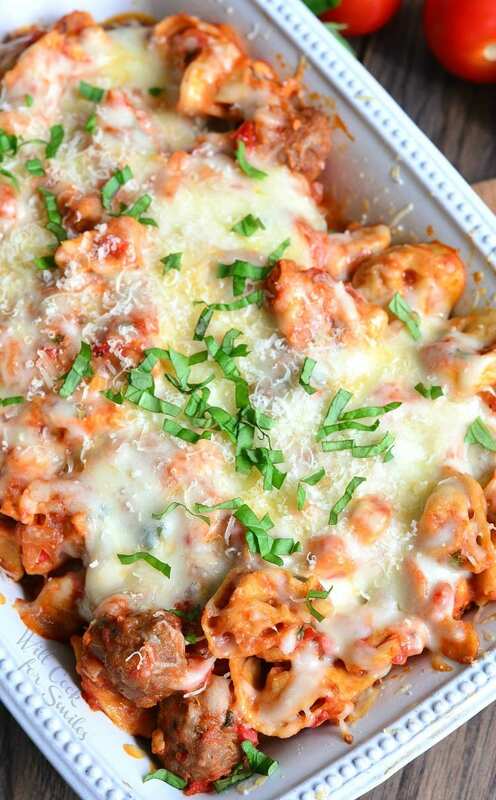 Add grated Asiago, Parmesan, and Romano cheeses to the bowl with meat and tortellini. Mix well and add pasta sauce. Mix everything together. Spread the mixture evenly in the casserole dish. 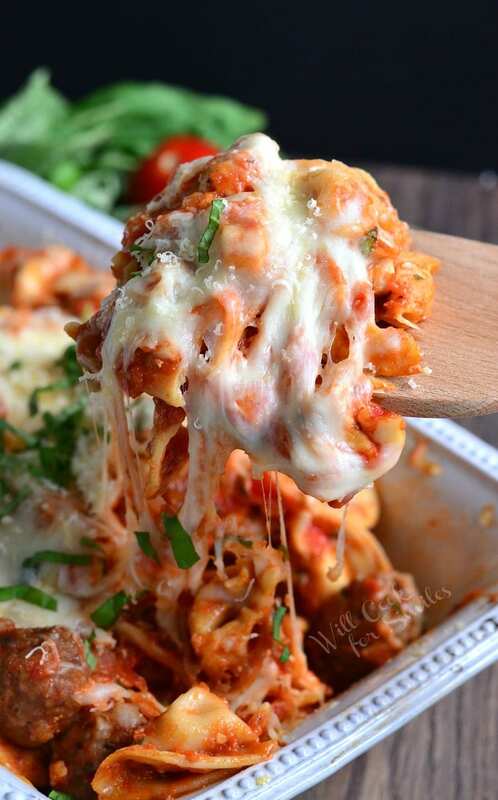 Top with Mozzarella cheese evenly and bake for about 15 minutes. Oh wow!! 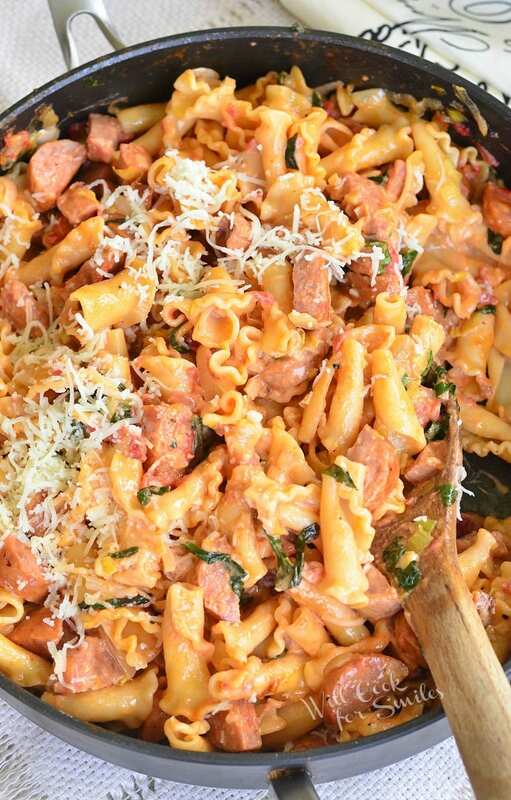 That is my type of dish – all of the great Italian flavors in one. I swear your photos have smellavision because I can smell the basil and the garlic. YUM! 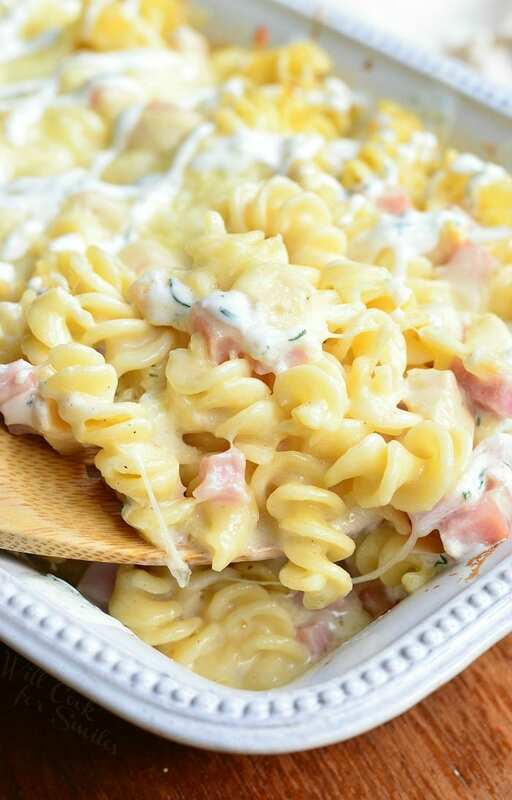 And boy, oh boy, that stretchy gooey cheese – to die for. Your little man will be super pleased. Have a great day!! I would estimate it by itself comfortably serving 4 people. It always depends on the appetite, like if you have teens 🙂 It would also depend what you are serving with it, like salads and breads. Wow, cheese chicken. I think it is unique combination. I can be taste food.